Soda fountain operators used these hot beverage recipes when making HOT soft drinks. They were considered unusual and a definite novelty, even back in their day. Regular fountain recipes for making egg creams, lemonades, fizzes, puffs, punches, and sodas were adapted to make hot beverages. An egg was sometimes added to add thickness and to help promote the drink as a liquid lunch. Try several drinks and see what you think. Hot sodas are maybe best appreciated on a cool winter's evening or after skating or tobogganing party. 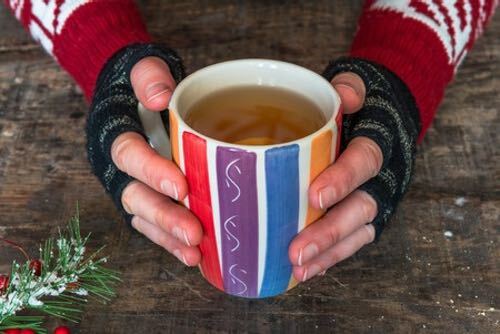 Enjoy experimenting with these hot beverage recipes. Hot soft drinks are great for serving at cool-weather parties. Try one for a unique liquid lunch. They're actually tasty and quite different from the normal soft drink. 3/4 ounce strawberry syrup, 3/4 ounce vanilla syrup, 1 egg, 1 ounce sweet cream. Shake well and fill mug with hot coffee; top off with whipped cream. 1 ounce vanilla syrup, white of 1 egg, 1 ounce sweet cream. Shake well, add whipped cream and fill cup with hot water. Cream in hot drinks is often replaced by ice cream where ice cream soda is served. One egg, one ounce each of cream and vanilla syrup; shake, and add hot milk. Price, 15 cents. Take 1 ounce pineapple syrup, 1 egg, half ounce cream, and hot water enough to fill an 8-ounce glass. Mix the syrup, egg, and cream together in a shaker, add the hot water, and mix all by pouring back and forth several times from shaker to mug. Or, prepare by beating the egg with a spoon, add the syrup and cream, mix all quickly with the spoon, and add hot water, stirring constantly, and strain. Prepare like Hot Egg Pineapple (above), substituting lemon syrup for the pineapple syrup, adding a small amount of lemon or lime juice, and omitting the cream. 1 ounce lime juice, white of 1 egg, 2 teaspoonfuls powdered sugar. Add hot water and top off with a small spoonful of whipped cream. 1-1/2 ounces orange syrup, 1 egg, 1 ounce cream, hot water enough to make 8 ounces. Mix the syrup, egg, and cream together in a shaker, shaking as in making cold egg drinks. Add a little hot water before serving. For this hot beverage recipe use two ounces of lemon syrup. Fill the mug with hot water. Mix and finish with a spoonful of marshmallow topping. Serve with cheese wafers. White of 1 egg, juice of 1 lemon, 3 spoonfuls powdered sugar. Mix with spoon and stir while adding hot water. Serve with nutmeg and cinnamon. One ounce of vanilla syrup, white of 1 egg, 1 ounce of cream. Shake well; add whipped cream and fill cup with hot water. 1/2 ounce strawberry juice, 1/2 ounce pineapple juice, 1 ounce vanilla syrup. Place in cup, fill with hot water, and top off with whipped cream. 1/2 ounce strawberry juice, 1/2 ounce raspberry juice, 1 ounce vanilla syrup, 1 cupful hot water. Top off with whipped cream. This hot beverage recipe makes a hot soda that's surprisingly good tasting, especially when served cold. Into a mixing glass put: 1/2 ounce Coca-Cola®, 1/2 ounce chocolate syrup, 2 ounces plain cream, 3 tablespoonfuls milk. Shake well, transfer into a 12-ounce bell glass and fill with hot water. This drink can be made with an egg, or it may be served cold. Price—10 cents; with egg, 15 cents. One egg, 2 ounces cherry juice or syrup, 1 spoonful powdered sugar. Mix thoroughly, continuing the stirring while adding the hot water. Then add two cherries and a slice of orange, and top off with nutmeg. 1 ounce lime juice, 1/2 ounce strawberry juice, 1 spoonful sugar. Fill up with hot water, stirring well. 1 ounce grape juice, 1 ounce lemon syrup, hot water to fill mug. Juice of half a lemon, 1 teaspoonful powdered sugar, twist a small portion of lemon peel over the cup so as to impart a flavor of the lemon, then fill up with hot water and stir. Break fresh egg into shaker. Shake well and pour into 5-ounce cup to strain. Flavor with sherry and one teaspoonful of sugar. Sprinkle a little cinnamon before pouring hot milk. Serve in a 10-ounce glass with two 5 o'clock teacakes. Some of the hot beverage recipes call for a vanilla, chocolate, or fruit flavored soda fountain syrup. I searched for the best supplier online, and the Prairie Moon Company is the only one I recommend. "The Jones fountain management has always had a record for progressiveness, and along this line it is interesting that this fountain was the pioneer in bringing the "hot soda" idea to Milwaukee. This was in the days when George A. Zahn, now manager of the fountain at the Tillema Candy Company's store, was in charge of the Jones fountain. It is perhaps unnecessary to say that the Jones fountain is open winter as well as summer." During the second half of the 1800s, hundreds of patents were filed for soda fountain designs. Dozens of manufacturers competed to make the most innovative models, and some were objects of real artistic worth featuring the finest marble art tiles and ornate gold filigree. Some designs, however, proved to be unpractical and short-lived. Some were unusual. One of the more unusual soda fountain designs belonged to A. D. Puffer of Boston, Massachusetts. Fountain operators always reported a drop in carbonated beverage sales once the cold weather arrived. So, in December 1862, Puffer invented his "Hot Soda Apparatus" to provide customers with piping hot soda water throughout the cold winter months. 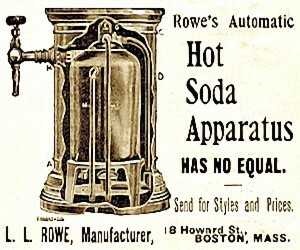 Puffer's bulky, silver-plated countertop apparatus sat on an iron stand and contained up to three gas-fired boilers to heat the soda water as it was dispensed. However, customers did not like the hot sodas very much as heating the soda water killed the carbonation, so regular hot water was substituted. Coffees, herbal teas, hot chocolate, and some fruit-flavored fountain syrups were the only flavors routinely ordered.